Director of the Tafelmusik Chamber Choir Ivars Taurins explains the origins of Handel's Messiah. "The Messiah is an amazing masterpiece telling this story of the life of Christ," says Ivars Taurins, director of the Tafelmusik Chamber Choir in Toronto. But there is a larger message in this piece and that's why Taurins thinks it has lasted for so long. Messiah, the oratorio written by George Frideric Handel, goes back to 16th century Rome when the art form emerged. Oratorios are similar to opera just without costumes and sets. When Handel began writing oratorios, his colleague handed him a libretto for a new oratorio on the theme of the life of Christ. Handel took the book and in a matter of two weeks he composed Messiah. "If you see the manuscript score, you can see the speed at which he is putting down his thoughts. It's like he can't get the ink to flow fast enough to get his thoughts down," explains Taurins. Eventually Handel brought his work to London, England where Messiah became a theatre performance. The church, however, felt that the theatre was no place for the story of Christ. "I think it had the same kind of scandal as 'Jesus Christ Superstar' did when it came out," says Taurins. There were debates and articles in the paper and the oratorio remained unsuccessful for many years. It wasn't until Handel used Messiah as one of the centrepieces for a charity concert did it become popular. "To cram more people in, they asked the women to refrain from wearing their hoop skirts and for men to not bring their swords," explains Taurins. The event was was a huge success and Handel raised a lot of money for a hospital, changing the public's perception of the piece. By the time Messiah got to the Victorian era, it turned into a Christmas performance. "With Dickens writing about the incredible poverty and the idea of charity" Taurins says Messiah was a piece of art considered to be in the same basket as A Christmas Carol, "so why not move it over to Christmas and there it has stayed,"
"When you consider the chaotic lives that we lead, the turmoil that happens around the world, this plea for peace on earth," is something we can all relate to add Taurins. The director says Messiah is "dealing with things that are larger than one religion or one faith. We are dealing with the journey from dark to light, from despair to hope." 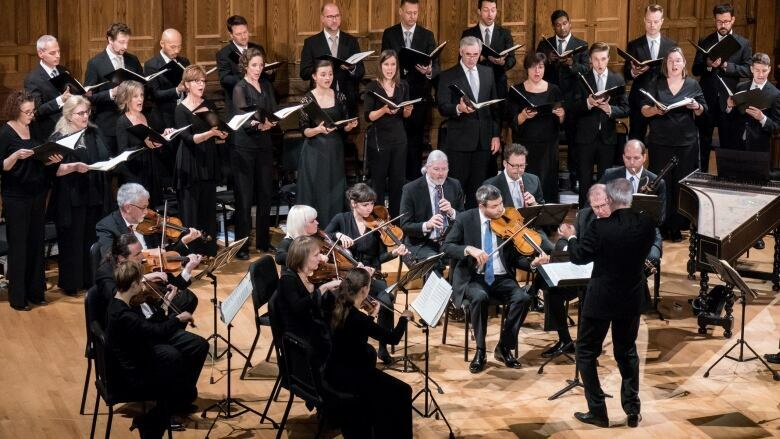 WEB EXTRA | Watch a preview of Tafelmusik's Messiah audience sing-along below.